Our Mother of Confidence Alpha – Why and How Do I Pray? Our Mother of Confidence > Alpha, free, free tacos, group, Jesus, life’s purpose, meet up, possibility, purpose, social, taco bar > Alpha – Why and How Do I Pray? Alpha – Why and How Do I Pray? Alpha is an opportunity to explore life and faith in a friendly, open and informal environment; it creates a culture of hospitality that blesses the entire church. If you are longing to see God do more in your life and the lives of those around you, Alpha could be the spark of change to help make this happen. 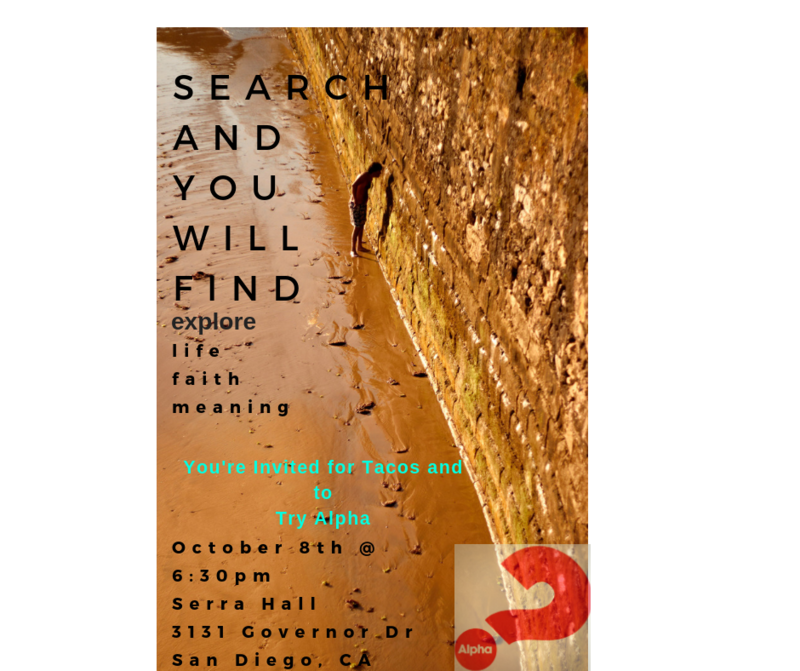 Our Alpha meet up is on Monday October 29th at 6:30pm in Serra Hall and runs for about 9 more weeks (same time/place). Each meet up is distinct, so you can see what one is like, or join in or out as you please. No commitment is needed. Please join us and bring a friend/relative/neighbor/co-worker!